Boxwood (Buxus) has over 70 species of this evergreen shrub. Originally from Europe, Asia, Africa and Central America. A number have been cultivated for their small, tough, evergreen leaves that accept pruning. Boxwood's are slow growing and has a distinctive aroma. Used in traditional gardens because of their adaptability to pruning. Boxwoods require relatively neutral, well-drained soil with plenty of organic matter. They will tolerate full sun, but they handle environmental stresses better if they're grown in partial shade. To reduce winter burn or ice damage, water heavily in fall and tie up branches by spiraling twine around the shrub from the bottom. Mulch in the summer to keep their shallow root systems cool. 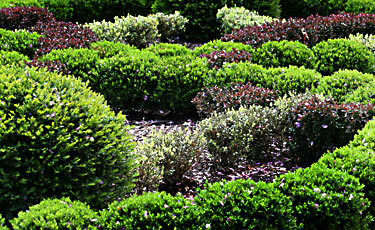 Small boxwoods can be used to edge walkways or formal herb or ornamental beds. Larger boxwoods can be used for hedges and topiary. 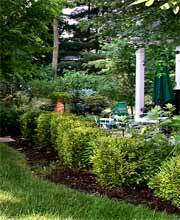 Boxwoods should be pruned heavily in early spring, or lightly in summer. Thin the interior annually to prevent fungal diseases.